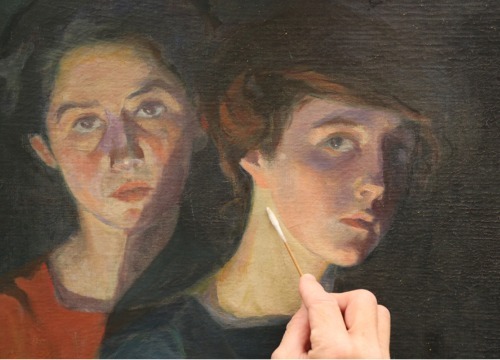 The restoration of Elisabeth Chaplin’s The Three Sisters at Pitti's Modern Art Gallery. Chaplin’s 1912 painting was restored by AWA in 2014. Prior restoration it was stored in Pitti’s storehouses, together with more than 600 of her works. They were gifted to the city of Florence in 1974 with the condition that artist could independently use and exhibit her paintings during her lifetime. Chaplin’s Florentine donation also included works by her uncle, painter Charles Chaplin and her mother, sculptor Marguerite Bavier-Chaufour. The painting depicts an evening scene featuring Yvette, Elisabeth and Nenette Chaplin. A show in the Tuscan hills and a Pitti home-coming. Chaplin's artistic talent was in her genes, but she broke the mold in all ways. AWA’s restoration sparked new interest in art by women. Here’s how.